TASC MEDIA PAGE: Here you will find photos and videos relating to TASC activities and issues impacting Topanga Canyon. 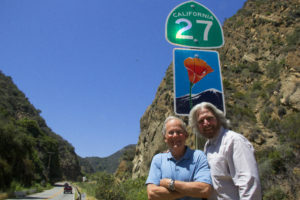 Roger (right) and Joseph at the newly installed Scenic Highway sign. Here is the Topanga Scenic Highway video created to present to the authorities in Sacramento as part of the effort to secure a scenic highway designation. TASC would like to thank Zev Yaroslavsky’s office, and specifically, Susan Nissman and Gina Natoli for helping as executive producers on this project.